The best price in Ukraine! WIDE SD1900CN - it is a color video monitor in a medical version with LCD display 19 '' (376.3mm x 301.1mm) with a protective glass panel and membrane control buttons with support for DICOM display and the ability to display 16.8 million colors. Membrane buttons allow you to make more convenient switch during operations when working on the stands or on the suspension. 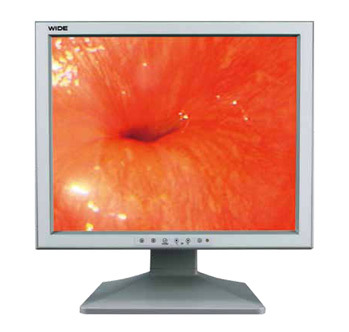 The presence of a digital (DVI) input and analog input (VGA), as well as video input (S-VIDEO) and composite video (BNC) allows active using of the surgical monitor WIDE SD1900CN not only as a second monitor on the doctor's workplace, but also as the primary monitor for ultrasound or endoscopic stands.